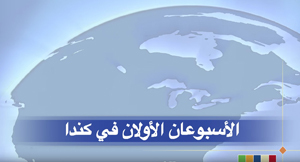 This Immigration, Refugees and Citizenship Canada (IRCC) video, Your First Two Weeks in Canada, is dubbed in Arabic and will help your learners get some information about living in Canada. Click on the image below to open the video. The CLB are national standards of English as a second language for adult immigrants. They are not a test nor a curriculum, but many tools and resources have been developed around them. There are 12 benchmarks divided into three stages for four skills: listening, speaking, reading and writing. They describe what a learner can do at each of the benchmarks, for example, a learner at CLB 1 in speaking should be able to communicate very basic information using a few, common words usually in response to simple questions. At CLB 12, a learner is at an extremely high level and will not need any help at all. A learner is not usually the same benchmark in each of the four skills. The CLB level means that the learner has completed most of the descriptors for that benchmark. Below is a link to the document. You can print the PDF version and use it freely. You may find the introduction page XVII will help you how to understand how to use the document. Come see the new and improved CLB Boot Camp and related online training modules. First developed in 2007, CCLB has recently updated the CLB Boot Camp, CLB for Lesson Planning and Integrating Assessment module with funding from the Ministry of Citizenship & Immigration of Ontario with advisory support funded by Citizenship & Immigration Canada. This 10 hour self-study platform allows you to familiarize yourself with the CLB’s and their role with planning and assessment. Click on the course, enroll yourself and start! An easy tool that you can use are the CAN DO statements. The Can Do statements will help you discuss with the learner what he or she can do and what needs to be learned. You can download and print these for free. Click on the image below to view the various levels in the 4 different skills. 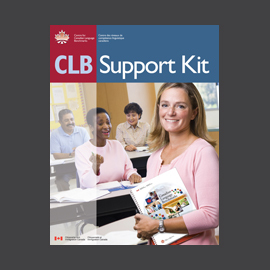 The CLB Support Kit provides lots of information on using the CLB with learners. The kit includes checklists, templates, lesson ideas and exemplars of tasks at the different benchmarks. A really useful part of the kit is the video, audio and writing examples of learners at CLB 1-12. The kit provides reasons for why the learner is at that benchmark. 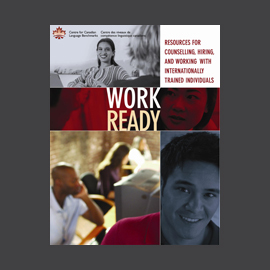 A free downloadable copy of this resource and exemplars can be found at bookshelf.language.ca. A selection of lesson plans are available for learners at levels CLB 1–8. These lessons are organized by theme, topic and CLB level and outline ideas for activities and tasks to help learners develop CLB competencies in all four skills. They can be found on the For Language Teachers page under the Lesson Plans tab. You may suspect that the learner has literacy needs. 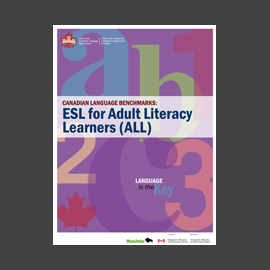 You can use the CLB: ESL for ALL (Adult Literacy Learners) to help you plan some learning activities. 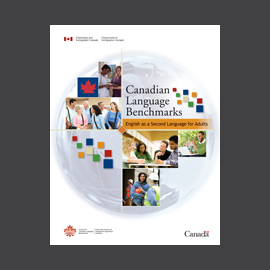 This document contains the literacy benchmarks which connect the CLB. A free downloadable copy is available by clicking on the image below. The Alberta Government and the Centre for Canadian Language Benchmarks (CCLB) are pleased to announce the launch of the new online self-study course An Introduction to ESL for ALL. The course should be of particular interest to literacy instructors as well as those seeking a refresher on the ESL for ALL literacy document. Please click here for more information on how to access this course. You can help your learner assess his or her language level though an online self-assessment that will provide the benchmark stage that the learner is in. Here is a document explaining the National Assessment Framework. If you want to help your learner understand his or her CLBPT results please see the For Language Learners page under the CLBPT Assessment Report tab. All learners, including literacy learners can be assessed at an assessment centre that offers CLB aligned tests. 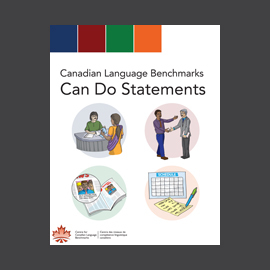 Can anyone use the Canadian Language Benchmarks? Yes, if the standards are used to support the assessment or training of adult immigrants to Canada. 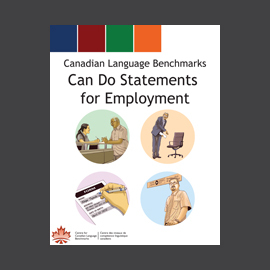 How can I get trained on using the Canadian Language Benchmarks? We suggest you start by completing Boot Camp at learning.language.ca. Many TESL training programs offer training on CLB or contact CCLB to learn about more courses. How do I know what level my learner is? The best way is to have the learner assessed using a CLB assessment. To find an assessment centre, go to the For Language Learners page under the Formal Assessment tab. Your learner can also take the online self-assessment. We also encourage you to discuss needs and progress with your learner using the CanDo statements. If your learner has literacy needs you can use the LPT 1 and 2. Can I expect my learner to be the same CLB in all four skills? Most learners have a jagged profile – meaning they are stronger in some skills than others. What tools will be most helpful for me as I work with my learner? Where can I get additional help or information? Contact info@language.ca for additional information or help.